After graduating with a degree in Education Studies and Geography in 2009, Sheri pursued a career with the Lincolnshire Wildlife Trust as an Education and Community Officer working at the Whisby Education Centre near Lincoln. On a daily basis she can be found out and about on the nature reserve and working with school groups, committed to helping children and adults experience the outdoors. She first developed an interest in bushcraft after spending a day in the woods with a friend who encouraged her to try something new. Lighting her first fire ignited the spark which led her on to spend more time in the woods, slowly developing her skills. Sheri attending her first bushcraft course - with Frontier Bushcraft - in 2012 and was invited to join the team as a Course Assistant in 2013. In addition to her outdoor skills and teaching ability, Sheri brings a wealth of knowledge and enthusiasm for the natural world to the Frontier team. 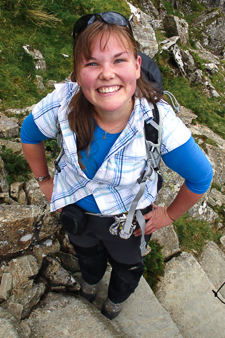 When not out in the woods or at work, she enjoys rock climbing, canoeing and hill walking, usually around the Peak District.